Parks and recreation is big in Montgomery County, with more than 30,000 acres of parkland, including a national park, state park and nine regional parks. The Montgomery County Parks Department maintains over 400 parks offering a range of recreational opportunities, including Brookside Gardens, an award-winning 50-acre public display garden. The Chesapeake and Ohio Canal National Park offers hiking and biking opportunities along the towpath, while rides on the historic carousel and ballroom dance classes are available at Glen Echo Park. 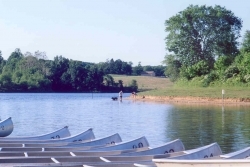 Patuxent River and Seneca Creek State Parks offer hiking, fishing, and horse paths, and Seneca Creek also provides bike paths, boat launches and rentals, canoeing and picnic areas. From dog parks to equestrian centers to ice rinks and splash playgrounds, Montgomery County has it all. There are 30 public and private golf courses in Montgomery County. The Maryland SoccerPlex welcomes more than 600,000 visitors a year to its 24 irrigated soccer fields and 5200 seat capacity Championship Stadium.